Time: Check in starts at 11am and STEP OFF is at 12 noon. Route: You get to choose...just keep stepping! You can run, walk around town, head home to run on a treadmill, go to your gym or even walk around the mall. There will even be jump ropes at Grace Church for anyone who wants to get in any last minute steps. DON'T HAVE A TRACKER...NO PROBLEM! AT CHECK IN, WE WILL BE ABLE TO ASSIST IN PLACING A FREE PEDOMETER APP ON YOUR SMART PHONE OR WE WILL LEND YOU A PEDOMETER TO WEAR FOR THE 2 HOUR EVENT. You can also go to the "RESOLUTION: STEP IT UP BONUS STEP" locations throughout Nyack to start accumulating BONUS steps. From 12-2pm, Strawberry Place on Broadway will be handing out 300 bonus step stickers to all who come in with their racing bib (one per person). 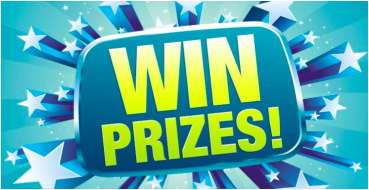 The Nyack Center will also be handing out 500 bonus step stickers to anyone who participates in their RESOLUTION: STEP IT UP indoor Volleyball pick up game. A detailed list of all of the BONUS STEP locations will be given out after check-in on New Year's Day. ​There will also be hot chocolate and yummy treats after check-out. HOW MANY STEPS WILL IT TAKE TO END HUNGER IN NYACK AND BEYOND? This New Year's Day, Nyack is ringing in 2016 with a resolution to end hunger in our community. 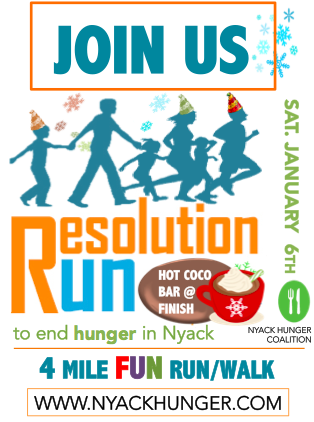 The Nyack Hunger Coalition is asking everyone to join them for two hours on New Year's Day with trackers in hand to end the hunger crisis in Nyack. So grab your Fitbit, Misfit, Nike Fuelband, pedometer or any activity tracker you have and join our efforts to STEP IT UP to end hunger in Nyack this New Year's Day. Don't have a tracker...no worries we can help and even lend you a pedometer for the event!